In an increasingly global world, entrepreneurs engage in international business travel more than ever before. This can be challenging, as each country has its own customs and way of doing business. Every place you visit on business will have a unique culture that dictates norms around communication, eating and drinking habits, and business dress. Add in the challenge of not being fluent in the language of the country you’re visiting and business travel can seem intimidating to many. Don’t overthink it! If you do your homework, you’ll be able to ensure that you make a good impression. To avoid faux pas when doing business abroad, make sure to read up on current events in the area you’ll be visiting. It’s also helpful to research the area’s customs and learn a few words of the language, just in case. 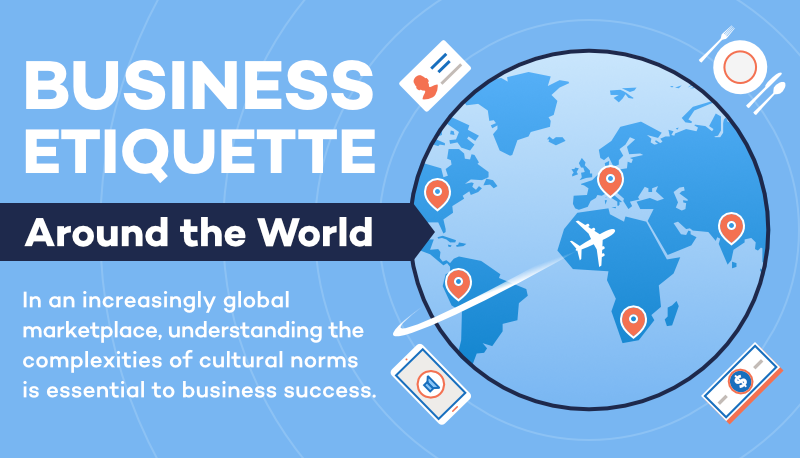 Fundera developed an infographic that highlights business etiquette around the world. Read on for basic business etiquette around the globe.